Summer's almost over! 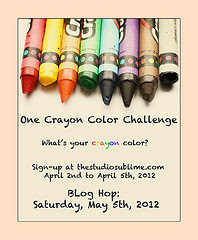 In a few more weeks, I have to go back to school and this time I'm teaching a new grade: Grade 4/5. I'm pretty excited about teaching this grade level for a number of reasons. It's an age group where I'd be teaching less of the basics of reading and writing and more interesting content material. I've never taught this age group before so I can't wait for the new experience. The problem is I have a lot of primary materials from teaching Grade 1 and 2's for so long. So how do I turn my primary materials into a junior classroom without spending a lot more money? 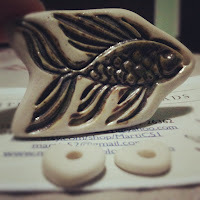 A few weeks ago, I ordered a ceramic pendent from Marti Conrad. 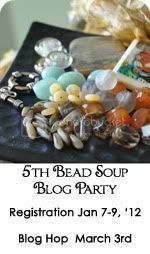 I've seen her work on the Bead Soup Cafe and loved it! 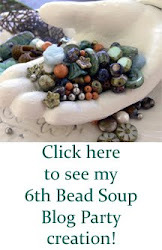 But I could never give myself a reason to spend the money on a new bead... until I saw this. It's a dark brownish fish pendent! And since I've been fishing a lot this summer (husband loves fishing) and I love her stuff, it was a great reason to finally get one of Marti's lovely beads. When I got it I was so happy! It's so pretty! But how do I make it into a necklace? Well, after blog hopping during the last reveal, I noticed many people used waxed linen to macrame jewellery pieces. I've never used waxed linen before so I think I'll try it on the fish pendent. I'll post the finished product once I get myself some waxed linen and create something.